Black Panther Hoodie: The Mantle Of King | Nerd Much? 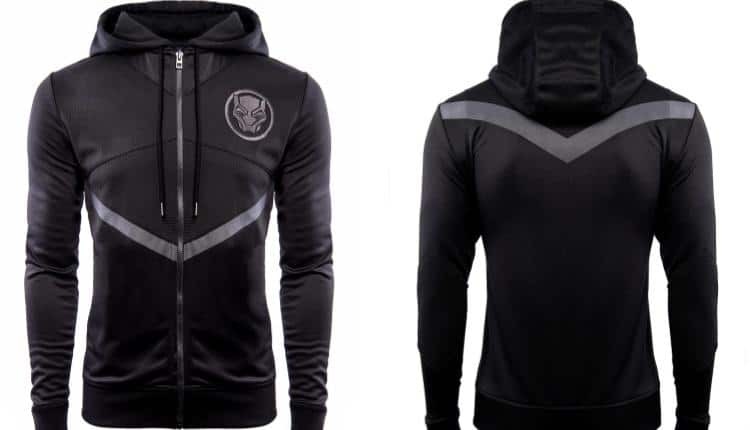 If you were a little jealous of Black Panther‘s sleek look, this Black Panther: The Mantle Of King Zip Hoodie is for you. It is currently priced at $61.99 USD and comes in men’s sizes small to XXL. This item is currently on pre-order and will be shipped June 2018. It is a little long to wait, but this Black Panther hoodie is worth it. It is well designed and made to look great on anyone. On the stage right of the hoodie on the upper chest portion is the Black Panther logo, embroidered in silver thread with a ring around it. This upper portion is overlaid with a black mesh, for that extra sporty and sleek look. Dividing the hoodie in half is a thin silver chevron, echoing the color and style of the Black Panther logo. There are two front pockets that will easily fit your phone and keys. The hem of the hoodie and sleeves are ribbed for structural integrity. On the back of the hoodie, at the shoulders, is another silver chevron. The back is otherwise plain black. The zipper in the middle is entirely metal and painted in a worn chrome black. If you are not sure about the sizing or whether or not this hoodie will look good on you, Merchoid has a great return policy. They give you 100 days to return your item, so you are covered if you decide against this hoodie in the end. Black Panther the movie is out in theaters now and was written and directed by Ryan Coogler. He is known for his work on Creed and Fruitvale Station, both thoughtful films that touch on racism. Black Panther stars Chadwick Boseman as Black Panther, Michael B. Jordan as Erik Killmonger, and Lupita Nyong’o as Nakia. All three show themselves to be exceptionally great actors in the film. Any praise for the film and its actors is certainly deserved. Buy it at Merchoid here.